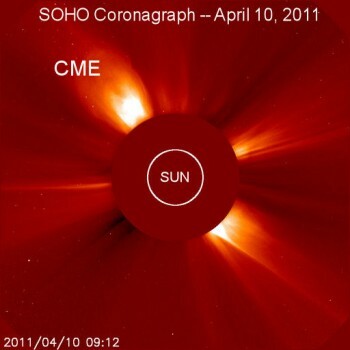 Newly arriving data from NASA’s STEREO probes suggest that a coronal mass ejection (CME) might be heading toward Earth. The source of the cloud appears to be sunspot complex 1185-1186, which experienced an episode of magnetic instability during the early hours of April 9th and again on the 10th. Since April 7th the active region has hurled massive clouds into space. High latitude sky watchers should be alert for auroras. NOAA forecasters estimate a 40% chance of geomagnetic activity during the next 48 hours, when a solar wind stream is expected to buffet Earth’s magnetic field. This movie to the right shows a spherical map of the Sun as it currently appears, formed from a combination of the latest STEREO Ahead and Behind beacon images, along with an SDO/AIA image in between. The movie starts with the view of the Sun as seen from Earth, with the 0 degree meridian line in the middle. The map then rotates through 360 degrees to show the part of the Sun not visible from Earth. STEREO consists of two space-based observatories – one ahead of Earth in its orbit, the other trailing behind. With this new pair of viewpoints, scientists are able to see the structure and evolution of solar storms as they blast from the Sun and move out through space. There are two kinds of solar storms, often related to each other: coronal mass ejections (CMEs) and solar flares. 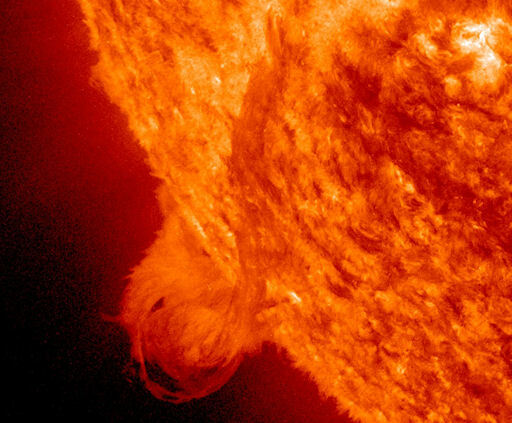 A flare occurs when magnetic energy builds to a peak near the Sun’s surface and explodes. This intense, fast-paced event results in an intense burst of light, including X-rays, in the Sun’s lower atmosphere. A much larger storm, a CME erupts when magnetic field lines snap, sending billions of tons of material into space at millions of miles per hour. The cloud expands to over 30 million miles by the time it reaches Earth. Both flares and CMEs can result in additional high speed particles being shot out into the solar system at close to the speed of light. A side-by-side comparison of the Sun from precisely two years ago (left, from SOHO) to the present (right, from Solar Dynamics Observatory) dramatically illustrates just how active the Sun has become. 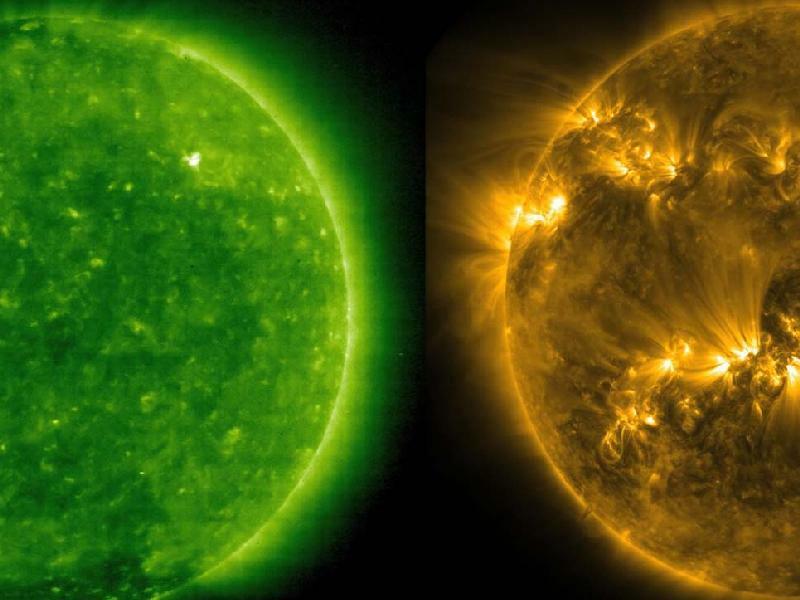 Viewed in two similar wavelengths of extreme ultraviolet light, the Sun now sports numerous active regions that appear as lighter areas that are capable of producing solar storms. Two years ago the Sun was in a very quiet period (solar minimum). The Sun's maximum period of activity is predicted to be around 2013, so we still have quite a ways to go. Click here to see the a composite of latest NASA LASCO C2 coronal images. Covering April 4-10, the GIF animation shows an amazing display of CME activity starting on April 7. This is a large file but worth downloading. When the ejection is directed towards the Earth and reaches it as an interplanetary CME (ICME), the shock wave of the traveling mass of solar energetic particles causes a geomagnetic storm that may disrupt the Earth’s magnetosphere, compressing it on the day side and extending the night-side magnetic tail. When the magnetosphere reconnects on the night side, it releases power on the order of terawatt scale, which is directed back toward the Earth’s upper atmosphere. This process can cause particularly strong auroras in large regions around Earth’s magnetic poles. These are also known as the Northern Lights (aurora borealis) in the northern hemisphere, and the Southern Lights (aurora australis) in the southern hemisphere. Aurora appear from Earth as shimmering, dancing lights in the night sky. Although green is the most common color, red and yellow hues are also observed. A coronal mass ejection observed April 10 by the SOHO spacecraft heralds the approach of an active region to the Earthside of the sun. The source of the blast is currently located behind the sun's northeastern limb, but solar rotation will turn it in our direction in the days ahead. Humans in space or at high altitudes, for example, in airplanes, risk exposure to intense radiation. Short-term damage might include skin irritation. Long-term consequences might include an increased risk of developing skin cancer. The Nuclear Safety Commission of Japan released a preliminary calculation Monday saying that the crippled Fukushima Daiichi nuclear plant had been releasing up to 10,000 terabecquerels of radioactive materials per hour at some point after a massive quake and tsunami hit northeastern Japan on March 11. The disclosure prompted the government to consider raising the accident’s severity level to 7, the worst on an international scale, from the current 5, government sources said. The level 7 on the International Nuclear Event Scale has only been applied to the 1986 Chernobyl catastrophe. The current provisional evaluation of 5 is at the same level as the Three Mile Island accident in the United States in 1979. According to an evaluation by the INES, level 7 accidents correspond with a release into the external environment radioactive materials equal to more than tens of thousands terabecquerels of radioactive iodine 131. One terabecquerel equals 1 trillion becquerels. Haruki Madarame, chairman of the commission, which is a government panel, said it has estimated that the release of 10,000 terabecquerels of radioactive materials per hour continued for several hours. The commission says the release has since come down to under 1 terabecquerel per hour and said that it is still examining the total amount of radioactive materials released. A strong earthquake struck north-eastern Japan at 5:16 PM, local time, on Monday, April 11. The earthquake’s magnitude was 7.0, and that its focus was in Fukushima Prefecture at a depth of 10 kilometers. Intensities of 6 minus on the Japanese scale of 0 to 7 were registered in some areas of Fukushima and Ibaraki prefectures, including Furudono Town, Nakajima Village and Hokota City. An intensity of 5 plus was registered in many areas in the southern Tohoku and northern Kanto regions. Several minor quakes occurred following the major quake at 5:16. The agency is also warning of possible aftershocks with intensities of 6 plus or 6 minus. The operator of the crippled Fukushima Daiichi nuclear power plant, Tokyo Electric Power Company, says radiation figures at monitoring posts around the plant remain unchanged. The utility firm also says outdoor workers had been ordered to temporarily evacuate. The operator of Fukushima Daiichi nuclear power plant says water injection into the crippled reactors was briefly suspended after outside power lines were shut down by a magnitude 7.0 earthquake on Monday evening. Tokyo Electric Power Company said that outside power was restored for reactors No.1, 2 and 3. Water injection was resumed for these reactors after a suspension of about 50 minutes. Radiation dose higher than 1000 mSv was measured at the surface of water accumulated on the basement of Unit 2 turbine building and in the tunnel for laying piping outside the building on Mar. 27th. Plutonium was detected from the soil sampled at Fukushima Dai-ichi NPS site on Mar. 21st, 22nd, 25th and 28th. The amount is so small that the Pu is not harmful to human body. Radioactive materials exceeding the regulatory limit have been detected from seawater sample collected in the sea surrounding the Fukushima Dai-ichi NPS since Mar. 21st. On Apr. 5th, 7.5 million times the legal limit of radioactive iodine, I-131, was detected from the seawater, which had been sampled near the water intake of Unit 2 on Apr 2nd. It was found on Apr. 2nd that there was highly radioactive (more than 1000mSv/hr) water in the concrete pit housing electrical cables and this water was leaking into the sea through cracks on the concrete wall. It was confirmed on Apr. 6th that the leakage of water stopped after injecting a hardening agent into holes drilled around the pit. Release of some 10,000 tons of low level radioactive wastewater into the sea began on Apr. 4th, in order to make room for the highly radioactive water mentioned above. Regarding the influence of the low level radioactive waste release, TEPCO evaluated that eating fish and seaweed caught near the plant every day for a year would add some 25% of the dose that the general pubic receive from the environment for a year. TEPCO and MEXT has expanded the monitoring for the surrounding sea area since Apr. 4th. Radioactive materials were detected from underground water sampled near the turbine buildings on Mar. 30th. It is presumed that radioactive material inside the reactor vessel may leaked outside at Unit 1, 2 and Unit 3, based on radioactive material found outside. NISA announced that the reactor pressure vessel of Unit 2 and 3 may have lost air tightness because of low pressure inside the pressure vessel. NISA told that it is unlikely that these are cracks or holes in the reactor pressure vessels on the same occasion. TEPCO started to inject nitrogen gas into the Unit 1 containment vessel to reduce the possibility of hydrogen explosion on Apr. 6th. The same measure will be taken for Unit 2 and 3. Steam like substance has been observed rising intermittently from the reactor building at Unit 1, 2, 3 and 4. Injecting and/or spraying water to the spent fuel pool has been conducted. Water injection to the reactor pressure vessel by temporary pumps were switched from seawater to freshwater at Unit 1, 2 and 3. High radiation circumstance hampering the work to restore originally installed pumps for injection. Discharging radioactive water in the basement of the buildings of Unit 1through 3 continue to improve this situation. Water transfer work is being made to secure a place for the water to go. Lighting in the turbine buildings became partly　available at Unit 1 through 4. Radioactive material was detected from milk and agricultural products from Fukushima and neighboring prefectures. The government issued order to limit shipment (21st-) and intake (23rd-) for some products. Radioactive iodine, exceeding the provisional legal limit, was detected from tap water sampled in some prefectures from Mar. 21st to 27th. Small fish caught in waters off the coast of Ibaraki on Apr. 4 have been found to contain radioactive cesium above the legal limit on Apr. 5th. It was decided on Apr. 5th that as a legal limit of radioactive iodine, the same amount for vegetables should be applied to fishery products for the time being. Linear thought is a 2-dimensional imposed system of thought that confines the thinker to one plane. This self-limiting system of thought arose out of the Dark Ages disguised as “enlightenment” and “renaissance” only to be revealed as an easily manipulated mechanism of control. The brain is a pattern recognition device, not a file cabinet with papers full of words. It does not natively operate in a linear, 2-dimensional way. Its firmware has been downgraded over the centuries. The brain stores information spatially with neural connections made from all planes and angles. Associations are formed that spawn new understandings when the brain matches an aspect of one pattern with another. These associations are exponentially linked and together they represent our portal to this reality. To throw out the thought constructs that have been imposed on man for generations and express ones true self by unleashing the holographic mind is the ultimate act of rebellion!